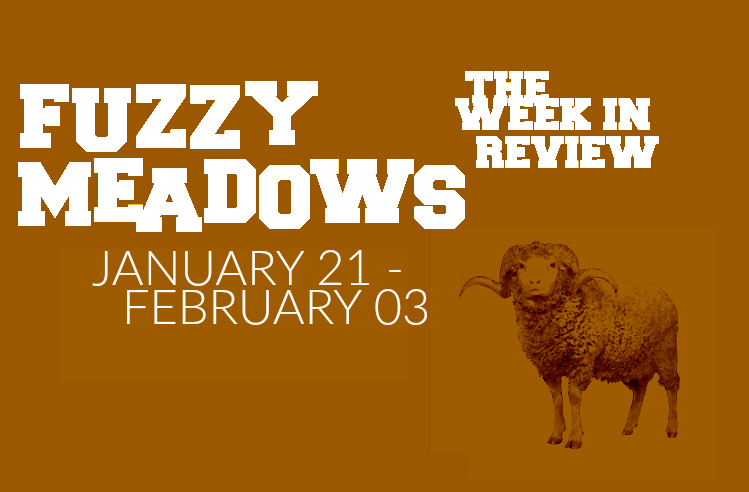 Welcome to FUZZY MEADOWS, our weekly recap of this week's new music. We're sharing our favorite releases of the week in the form of albums, singles, and music videos along with the "further listening" section of new and notable releases from around the web. It's generally written in the early hours of the morning and semi-unedited... but full of love and heart. The list is in alphabetical order and we sincerely recommend checking out all the music we've included. There's a lot of great new music being released. Support the bands you love. Spread the word and buy some new music. *Disclaimer: We are making a conscious effort not to include any artist in our countdown on back-to-back weeks in order to diversify the feature, so be sure to check the "further listening" as well because it's often of top-notch quality too. The ever dependable awesome twosome best known as Big Business have returned to our good graces with “Let Them Grind,” the first single from their sixth record, The Beast In You, due out April 12th via Joyful Noise Recordings. As one of the best bands of the past fifteen years or so, expectations are always high for a new release from the art-sludge mainstays, and once again, the duo of Coady Willis and Jared Warren have delivered upon their signature sound while continuing to push forward with pop experimentations and avant-garde structuring. “Let Them Grind” is quintessential Big Business, with a massive hypnotic bass rumble that bleeds all over the track and Willis’ polyrhythmic beat punching holes in the walls around him. The melodic howling and bellowing shouts of “can’t stop grinding my teeth” and “gonna feed you like the beast you are” soar over the low end murk, and it’s too perfect. We recently wrote about the ever prolific and eternal Buck Gooter in the first “Fuzzy Meadows” of the year, but with the release of “Skunks Are Cool,” the second single from the duo’s upcoming eighteenth album, Finer Thorns, it was clear we had to include them again. The song features a bombastic tribal rhythm akin to something from Pretty Hate Machine era NIN, but beyond that this one is all Gooter. Its not just a fun title, this song lists that many cool virtues of skunks, including the fact that they are not for sale and they would in fact make a better president than that turd in the office. The guitars scrape in together with the proto-industrial collision, the whole thing sounding something like the most fucked up of danceable noise punk. Community College is a brilliant lo-fi collective led by Horse Jumper of Love’s own John Margaris together with his brother, Dan Margaris (drums) and Dimitri Giannopolous (bass, also of Horse Jumper). The band occupies a similar space as their main act, offering detached pop songs with surreal yet relatable lyrics and earworm melodies tucked just under the fuzzy presence of the room. After nearly five years of sporadic activity, Community College will release their debut album Comco on March 8th. Opening tracks “Karaoke” and “Novocaine” are a pair of slow burners that slip in the most colossal of melodic nuances when you’re least expecting it. “Karaoke” is barely a minute long, but the fragile nature and stop/start pacing works to its advantage, fleshing out distinct sections in short gasps. “Novocaine” is almost twice as long, but still under the two minute mark. The drums rattle in loose stuttered rhythms as the guitars wander further down into the depths of depressive expression, each note ringing out in its own glacial pace. There’s a feeling of broken time, where everything stands still and nothing is quite right, but that’s maybe the beauty of it all. The thing about Dan Francia’s full length debut is that you’ve never heard anything quite like it. Come Back To Life is a singular vision in its compositional construction, but it's a thousand ideas coming together from a cast of near 40 musicians. Everyone plays their part (both big and small) to carry out Francia’s cinematic world of freak jazz, fractured twee, warm acoustic rock, and jerky punk. It’s unpredictable from song to song and from verse to verse within those songs. Anything can and will happen, thanks to guests like Emma Witmer (gobbinjr), Ani Ivry-Block (Palberta/Shimmer), Luke Chiaruttini (Bueno), and of course one of Brooklyn’s finest bassists, the man of hour, Dan Francia himself. St. Louis’ Glued have spent the past few years becoming one of the Midwest’s most exciting bands. While their previous EPs were all exceptional in short bursts, Glued are set to release Cool Evil, their full length debut, on March 1st via Born Yesterday Records. They’ve pulled back the fuzz and reverb that coated so much of their prior work, and every knotted guitar convulsion and snapped rhythm can be heard in clarity, the band sounding better than ever as the atmosphere crumbles around them. “Used To It,” the album’s first single is anxious and menacing, a deep dive into the post-punk and progressive world Glued have made their own. Led by drummer/vocalist Chelsi Webster, the song takes a sarcastically apathetic tone to the apathy all around us. Not everything about the moon is majestic. Sure, the lunar eclipse was nice, but Mammoth Grinder’s “Lunar Mass” is something far more brutal. The sludgy metal/grind band (which features members of Power Trip) follow up last year’s incredible, Cosmic Crypt, with a limited edition flexi for Decibel that rips that a dizzying riff and a general filth that takes a lifetime to master. There’s a stoned quality to the swing of the riff and the apocalyptic howl that lurches and demonically yelps above it. The band eventually kick that sludge metal twang into breakneck speed, playing it in double time, pounding with stampeding drums and buzzsaw guitars that welcome the end times at a sprinting pace. Of all the recent French-pop influenced bands indebted to Stereolab and Broadcast to arise over the past couple of years, Montreal’s MUNYA could just be our favorite. While her music leans closer to the synth pop side of things, there’s a retro futuristic feeling to it and undeniable charm. Set to release Blue Pine, her third EP and a self-titled album that compiles all three of the EPs in early March, “It’s All About You” is a swirling pop song that draws funky rhythms, swirling synths, and Josie Bolvin’s airy vocals. The drums skitter and slide behind the tight beat together with an incredibly silky bass line and melodies that shift on a dime with soulful grace and psychedelic R&B wonder. Immerse yourselves in the joy of Melbourne’s Parsnip. The quartet have only been around for a year or so but their garage pop bliss is spreading its way across and Australia and starting to reach listeners worldwide. Their sound is rooted in both retro “girl group” pop and surf rock, a shimmering blend of tightly wound melodies and impeccable vocal harmonies at every turn. It’s damn near impossible not to instantly fall in love with their music, their fuzzy, warm, and vibrant songs wasting no time and leaving a big impact. Opening with a jangle so well crafted its damn near poetic, “Feeling Small” is essentially a sad song, but you’d never know it. They jitter their way into a blown out blues solo, whirring keys, and some spirited shouting. It’s finally been done, St. Louis’ Shady Bug have actually perfected the mix of heavy fuzz and syrupy sweet melodies. The band’s twin guitars are nimble and explosive, weaving in and out of one other and erupting with short notice, blanketing Hannah Rainey’s gorgeous vocal melodies with sounds that push and pull in different directions, both jagged and dreamy. The band are all about keeping things off balance, from seething walls of shoegaze like distortion to gentle verses that swerve on a disjointed groove, Shady Bug’s sound is dynamic and infectious. The band’s sophomore album Lemon Lime is due out on March 8th via Exploding In Sound Records and word has it the label is beyond thrilled to be involved. Ben Grigg is arguably Chicago’s nicest person and undeniably the city’s best kept secret when it comes to making fuzzed out indie rock. Having spent many years playing keys in Geronimo!, he’s stayed just as active in the years since with Future Biff, FCKR JR, and most commonly his basement recording project, Whelpwisher. While not an active band in the traditional sense, one quick “follow” of their Bandcamp page entails a delightful email every six months or so with a new record, each with brilliantly warped pop made for their sheer joy of making music. Stale Honey, the latest Whelpwisher release was originally intended to be a Future Biff record (before Kelly Johnson moved out West), but thankfully Grigg has completed the songs, a rapid collection of full blown ideas delivered in swarming minute and a half long distortion trails. It’s refreshing as hell, and the songs are all awesome.